Elephants are magnificent animals. We’ve seen them, perhaps, at the zoo or the circus and realized the enormous size from a reasonable distance away. I’ve been close enough to elephants to pat a trunk several times in my life, and actually did once. In 1974 an arena was build in Richfield, Ohio, the Richfield Coliseum. It was home to the Cleveland Cavaliers and other more minor sport teams; hosted all manner of concerts and, of course, the circus. There is a railroad track down in the valley, in Peninsula, at the bottom of the hill from Richfield. I don’t know how the circus came to other towns, but here it came to Peninsula and went up the hill to Richfield. The coliseum closed in the early nineties, but we came here in time to watch the last circus arrive and move up the hill. That was an event in itself, as you can imagine. People came from miles about and lined the highway for hours to watch the elephants go up the hill. They came back several days later to watch the elephants march back down the hill to board the train in the valley. 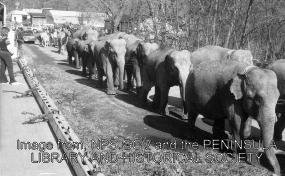 Many other animals went past, their cages on open trucks, but they lacked the presence of the mighty elephants, trunk to tail, moving slowly past. As if that was not enough for a lifetime, I had an even closer elephant encounter some years later. I was exhibiting at Lincoln Center, with both Beth and Ann riding shotgun, and we stayed just across the GW in Ft. Lee, New Jersey. The last morning Ann looked out the window down onto the parking lot and told us to please hurry over and confirm she was looking at elephants. We hustled down and approached the huge rig parked at the back of the lot. Two elephants were being led around the lot for exercise. They were en route to their next engagement and the crew stayed the night at the motel. We were allowed to approach, under the trainer’s direction, and look straight up at an elephant who responded by patting us down with a trunk. It was an impressive moment. My last elephant encounter predates these two by many, many years, but saved for last. I lived in Willoughby, just down the road from Mentor, I was married, Beth was going on two and I was very pregnant with Shelly. Oh, and it was summer and it was hot. My husband was a salesman and had been given tickets to a small circus performance to be held at the Mentor High School. I did not want to go. I never cared for circuses, I was sick every day of that pregnancy and the thought of enduring circus smells while supervising a tot for several hours was overwhelming. I could not persuade him to take a friend to use up that other ticket, or just take Beth, the hell with the other ticket, and so there I sat on floor level bleachers, early, so we would miss nothing, on a hot summer night. All I recall of the entire event was the parade of the elephants around the gymnasium. They were like a grey wall in front of us; I held a terrorized child on my lap. I heard my husband curse and looked up in time to see a tail lift and an elephant patty descend. It landed directly on his feet. Elephants I find interesting. Clowns and the circus are creepy. That elephant was on your side! I met an elephant at a zoo when young...running his trunk over me. I loved it and would love to be able to meet one again. Kind of made the whole ordeal worth while didn't it lol? Amazing! Our town's zoo is famous for the small elephant herd that lives here and all the baby elephants that have been born over the years. At nearly all tourist/souvenir kiosks, one can buy Zoo Doo--small cans of elephant poo! How cool to be up close and personal with creatures so unusual and amazing...even if one of them gave your hubby a pie. Who doesn't love elephants, well, except your ex husband. When I was a kid and lived in New York, my parents often took us to the Bronx Zoo. I remember very distinctly riding a baby elephant in the children's zoo. Or maybe it was a camel. I know it was not a pony. Whatever, it was a big and did not smell very good. You are SO good at those story endings! Elephants are certainly majestic beasts even the pink ones!!. The city in which I live has banned circuses which use animals. Which I support. Hypocrite that I am. I rode an elephant while in India (goodness that animal farted, and farted, and farted) and suspect that he (the elephant) was treated worse than circus animals in Oz. When I was very little, about 4 I think, the zoo here in Adelaide had an elephant which kids could ride on. you bought a ticket and climbed up to a platform so that you could step on to the seats on either side of her. Four kids per side, and off she would go around a few exhibits. I'll never forget it. Once upon a time, a long time ago when I was about 16, I was camping out with my 3 best friends. As best girlfriends do we talked and talked for many hours -- laughing and philosophizing in our sleeping bags. Soon the talk died down as we began to feel drowsier and drowsier and from nowhere in particular one of the girls suddenly exclaimed, "Aren't elephants wonderful?" This outburst was so sudden and surprising that we burst into gales of laughter and I exclaimed that if I ever wrote a book that is what I would call it! Oh what a day that was, waiting for the circus to come up the hill. We missed the chance to get up the hill before the long walk started and I had to drive roundabout to get us up there. We had prime space to watch. Had to wait a long time for them to get to the top of the hill, but it was worth it. You may have never liked circuses but mom was smart enough to realize I could not handle going to one so that was the closest I ever got to those animals. It was amazing. serves him right. I love elephants. they are so majestic and intelligent. I've read stories where elephants were separated and then reunited decades later at sanctuaries and they greet each other like long lost friends, which, of course, they are. Thankfully, there is now an elephant sanctuary in Tennessee where all of those poor elephants can go to live in peace in their final years. Being a circus elephant must be a dreadful way of life! elephant encounter are by there nature very memorable. Did you say "I told you so" at the end of that last story? Wow! No kidding you had close encounters with elephants! That's amazing! I hope it missed his foot. I bet your husband wasn't so thrilled with the circus after that. I had an elephant spit on me at the zoo one day. I had just bought a pop and was more upset that the spit got in the pop than the spit being in my hair. Never really trusted them after that.